The songs in this CD are inspirational and written as a motivational help in taking the steps necessary for successfully walking the spiritual path. It is the companion CD to the book: ASTROLOGY FOR THE SOUL, as the lesson of each North Node sign is linked to one of the songs. Printed lyrics included. The songs in this CD are inspirational and written as a motivational help in taking the steps necessary for successfully walking the spiritual path. It is the companion CD to the book: ASTROLOGY FOR THE SOUL (see below), as the lesson of each North Node sign is linked to one of the songs. Printed lyrics included. You can hear a sample of all 12 songs by CLICKING HERE. 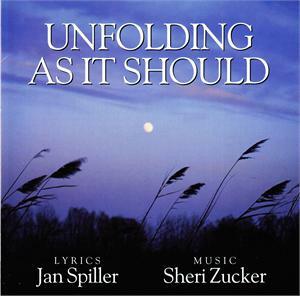 UNFOLDING AS IT SHOULD is available on CD and cassette tape.